When calculating the total costs associated with the development of a new application or system, three cost components must be considered. 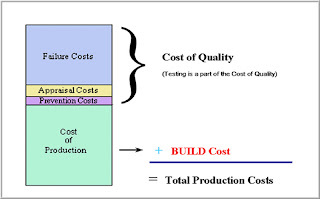 The Cost of Quality, as seen in Figure, is all the costs that occur beyond the cost of producing the product “right the first time.” Cost of Quality is a term used to quantify the total cost of prevention and appraisal, and costs associated with the production of software. The Cost of Quality includes the additional costs associated with assuring that the product delivered meets the quality goals established for the product. This cost component is called the Cost of Quality, and includes all costs associated with the prevention, identification, and correction of product defects. Money required to prevent errors and to do the job right the first time. These normally require up-front costs for benefits that will be derived months or even years later. This category includes money spent on establishing methods and procedures, training workers, acquiring tools, and planning for quality. Prevention money is all spent before the product is actually built. Money spent to review completed products against requirements. Appraisal includes the cost of inspections, testing, and reviews. This money is spent after the product is built but before it is shipped to the user or moved into production. The costs associated with defective products that have been delivered to the user or moved into production. Some failure costs involve repairing products to make them meet requirements. Others are costs generated by failures such as the cost of operating faulty products, damage incurred by using them, and the costs associated with operating a Help Desk. The Cost of Quality will vary from one organization to the next. The majority of costs associated with the Cost of Quality are associated with the identification and correction of defects. To minimize production costs, the project team must focus on defect prevention. The goal is to optimize the production process to the extent that rework is eliminated and inspection is built into the production process. The IT quality assurance group must identify the costs within these three categories, quantify them, and then develop programs to minimize the totality of these three costs. Applying the concepts of continuous testing to the systems development process can reduce the cost of quality.